The quality of an instrument combines the knowledge and skill of the craftsman. The classical guitar is more than a means of expression, it is a work of art. Many years of experience in the manufacturing of high-end, handcrafted furnishings has taught me about the unique properties and differences in a variety of species of wood. With this knowledge, skill and interest generated by playing the classical guitar, I have combined, as a self-made man, career and passion. To reach this level of quality, I construct handmade instruments with all the components of the guitar in my own workshop. 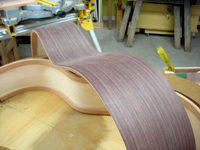 This direct contact with wood enables me to offer you an instrument of exceptional quality. Each guitar is the reflection of my passion for wood and music.